The Narasimha Kavacha Stotra is a powerful mantra from the Brahmanda Purana, formerly spoken by Prahlada Maharaja. It is said that one who chants this mantra is bestowed with all opulence and will be elevated to the heavenly planets. 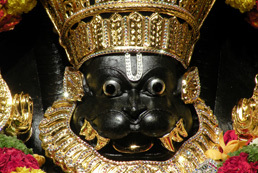 One should first meditate on the transcendental form of Lord Narasimha (as described in verses 3 to 6 of the stotra) and pray to Him for protection. 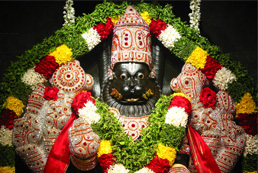 The Narasimha Kavacha Stotra is the king of all mantras (mantra-raja). 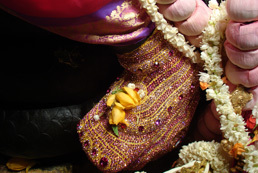 Make an offering at the lotus feet of Lord Narasimh. Offer garlands of Tulasi leaves to the Lord on Ekadashi. Offer a special puja to the Lord, the remover of all obstacles . It overcomes all kinds of impediments and provides one with all protection. It bestows upon one all opulence and can elevate one to the heavenly planets or provide liberation. It protects one from all directions and frees one from all sins. All of one’s desires are fulfilled – wealth, good family, long life, etc. It wards of the evil influence of all planets and disturbances by ghosts. One who regularly chants this prayer, whether once or thrice in a day, becomes victorious. By reciting this mantra and meditating upon Lord Narasimhadeva, all of one’s diseases are vanquished, especially those of the abdomen.